Open the LEGO® Friends Advent Calendar each day in December to add a piece to your Christmas party scene. Includes a Stephanie mini-doll figure in a calendar with 24 secret compartments, each containing its own buildable surprise. Price is 11% below the initial Lego retail price, a € 2.35 discount! This comes down to 9.21 cent per brick. The LEGO® Friends Advent Calendar (41326) Lego set is available from the sites below. However, they do not offer delivery to your selected region. The LEGO® Friends Advent Calendar (41326) Lego set is no longer directly available from the sites below. However, 3rd party partners of these sites might still have the set available. Alternate description Count down to Christmas with LEGO® Friends! Includes a Stephanie mini-doll figure in a festive outfit. Features 24 gifts, each enclosed in its own compartment in a LEGO® Friends holiday-themed calendar. 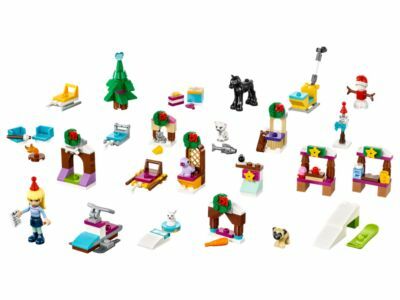 Collect 24 buildable surprises including furry friends and their homes, Christmas tree, gifts and all sorts of surprises. Visit LEGO.com/Friends when you've collected all the gifts to discover a special combination build on Christmas Day! Ask your parents’ permission.